In order to build a home recording studio you need an audio interface, a microphone, headphones, studio monitors, cables and a recording software. But if you’re planning to buy reasonable items, you will need to spend at least a budget of $400. Focusrite is one of the most appreciated recording studio equipment manufacturers in the world, and they are creating high-end recording systems for over 25 years. Most top-rated studio engineers are using at least one Focusrite product in their recording or mixing chain. Now, Focusrite decided to release cheaper solutions for home studio setups. Amongst various microphones and recording interfaces, we find a complete portable studio equipment with outstanding Focusrite quality that’s actually affordable – $244. 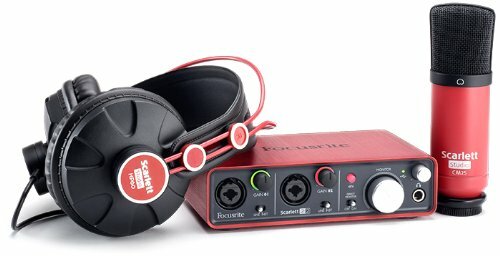 The package contains a quality microphone, Scarlett 2i2 audio interface, referencing headphones, recording software and Scarlett XLR mic cables. This high-quality microphone is the first in the recording chain. CM25 beautifully captures the soul of any vocal or acoustic instruments. The recordings are clean, quite and smooth, just like the quality of professional microphones. The audio interface is the center of your studio equipment, because every peripheral is connected to it. Scarlett 2i2 features 2 inputs and 2 outputs and it brings the legendary quality imposed by Focusrite products. You will appreciate the two award wining mic pre-amps, and if you read the reviews you will understand that these pre-amps are the the best in its class. It can record in 24-bit @ 96kHz sampling and 105dB dynamic range. These headphones can be used when you record vocals, in order to capture only the voice. Thanks to their high accuracy, HP60 can be successful used when mixing and mastering songs. If you have read my past posts on recording studios, you know that I love Cubase recording software. Well, this affordable package includes a free minimal version of Cubase 6 (which costs $350). The software allows you to record just like a pro, using multi-tracks and applying effects (EQ, compression, reverb, pitch-correction) to individual tracks. If you plan to build a recording studio at an affordable price, this Focusrite Home Studio Package is one of the best choices you can make. Bought individually, all these items will probably cost around $400. But, for $244, you get a complete solution for your home studio: the microphone, the audio interface (with preamp and Phantom Power), the monitor headphones and the recording software. You only need to buy a cheap mic stand and a pop filter and you’re ready to walk down the path of becoming a music star!